For the last 50 years, Butterick has relied upon services of Phillip Lack and Arnold Luster to design their pattern envelopes. Surely you have seen the work of Lack/Luster? Their mission statement is basically to allow the sewist as much freedom of inspiration as possible, by providing no inspiration on the envelope. 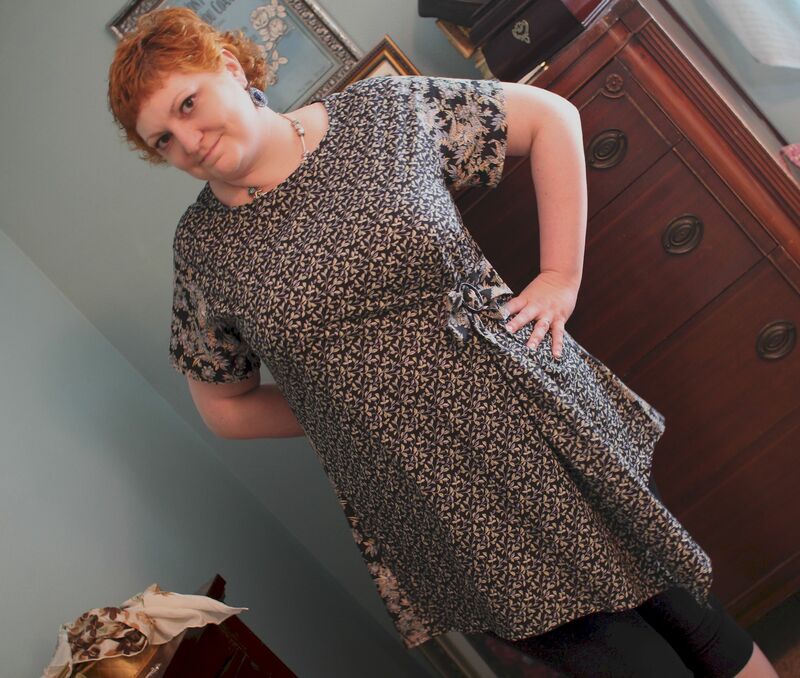 Butterick 6132- Don’t throw your jaw out yawning. No, missy- don’t you turn around- I can only take so much! I honestly can’t say how this got into the buggy. Usually the hubs grabs the patterns from the bins as I call out numbers from my tuffet er, seat at the pattern books. He’s quite helpful- he’s gotten patterns for other people if they call out a number and a size. But, usually, he will have a comment about the style- something charming, like- ‘planning to start fencing?’ ‘Please tell me it’s a gift’ or ‘oh yay, we’re going to Comicon!’ So rarely does a clunker slip past him. It’s good for our hot ‘if that fabric presses against me one more time, I’ll take lives’ weather. Mr B liked it. Sometimes, I just never know. He’ll probably claim he found the pattern on purpose. He’s like that- he knows everything. It makes telling him he’s wrong a true ordeal. It’s my cross to bear. Sigh. I shortened the sleeves about 2 inches. Again- left over fabric, I weaseled this all the way! By the by- I prefer to inset sleeves- I find them easier to alter and just lay better. I must make a note to ignore the instructions more. Once I got the pleaty business on the left front set, I realized it could be secured a bit more to almost create a defining shape. But I hated the look of it- it looked too much like I was seeing the back side or something. Too structural- so it times of great want- we slap a bow on it! Ready for the yard pictures? Well, too bad. Its mucky out and the camera is being mean. So my plan was to sneak some shots in a corner of the bedroom. I was able to get about 3 before the usual happened. Well, first the camera kept tilting. 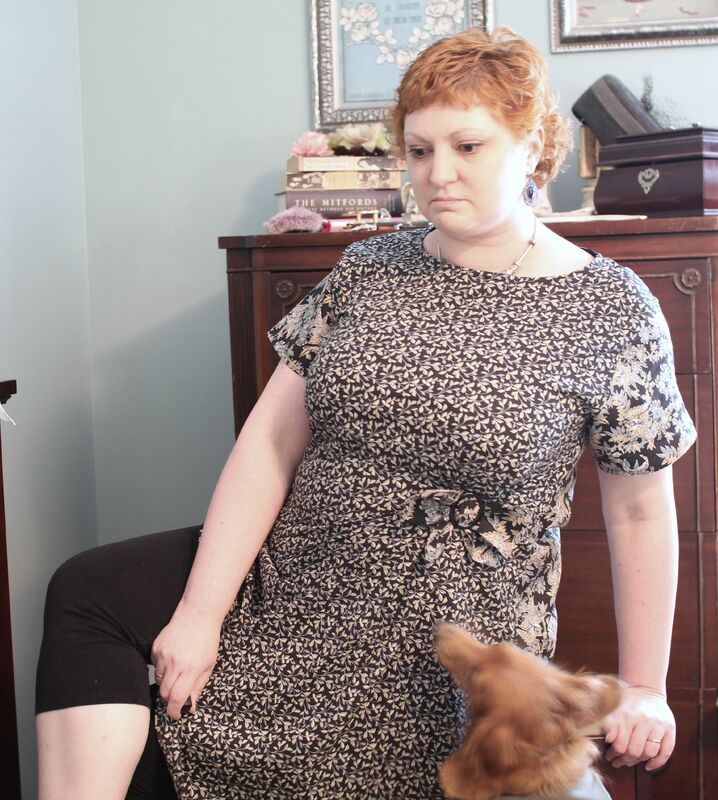 I wedged a bookmark under it to keep it straight, but a full length shot was just not happening, so I decided to pose on the steps the pups use to get on the bed. Yes, we are THOSE people. Not only do dachshunds sleep on me- they use their own carpeted stairs to do it. No judgement, it cuts down on the heating bills and any ridiculous ideas you could have about sleeping in all day like a sloth. Alright, I must be quick with my review, the pups are coming.Why oh why do shapeless shifts always seem to want a pointless back seam? It had all the curve of a good 2×4. So I just cut on the fold and figured a fish eye dart or 2 could work, but it didn’t really need any- or should I say, I didn’t have room for any? Whatever. I think this pattern leaves a lot of room for color play, blocking and a serious statement piece fabric. Don’t be surprised it I make you look at this again sometime- this was sort of an unplanned event with left overs, but its so comfortable and yet I don’t feel tent-wrapped. Me likey. Not a pattern to replace all others, but a good staple for the arsenal. I like this top more than the pictures show, but the melodramtic feel is probably because I am fresh from the photo shoot so any ounce of self-worth I felt is gone with the chins, as they say. We ended up with 2 photo settings here- me in focus or a cute dog in focus. Never the twain did meet!? 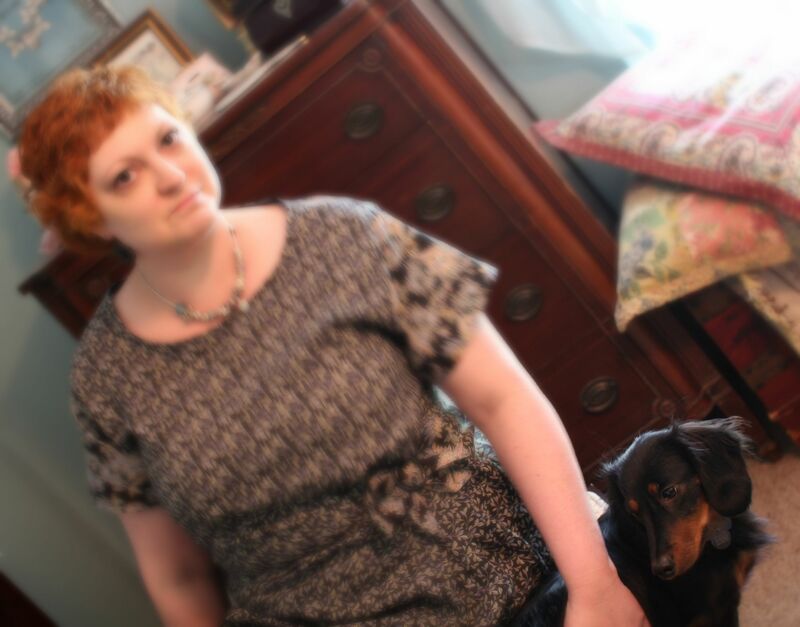 I also encountered the ‘Victorian ghost dog’ phenomenon- behold- my supernatural out takes! photo credits: little me, pattern review, google images. All images remain the property of their original owners. Come on- you know they work there!!! It’s like your dog is made of lightning! But seriously, this is a good solid pattern, and the bow absolutely makes it better as does the subtle contrast you’ve added in the sleeves. 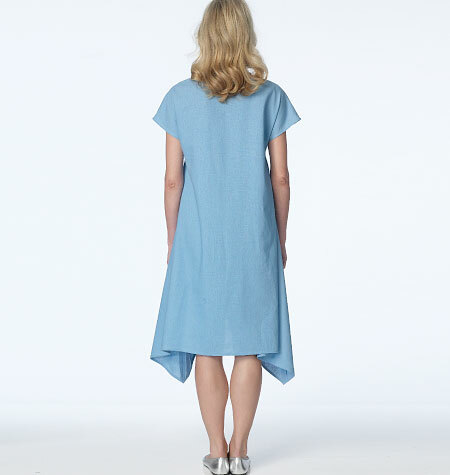 The back shot of the pattern model is hilarious–what on earth was that poor girl’s direction in the shoot? What is it about bad pattern illustrations? On the other end, I’ve gotten carried away by excellent pattern illustrations and ended up making things that were 100% wrong for me. Somewhere between Srs. Lack and Luster there has to be a practical give you the info style of illustration that also doesn’t deceive. 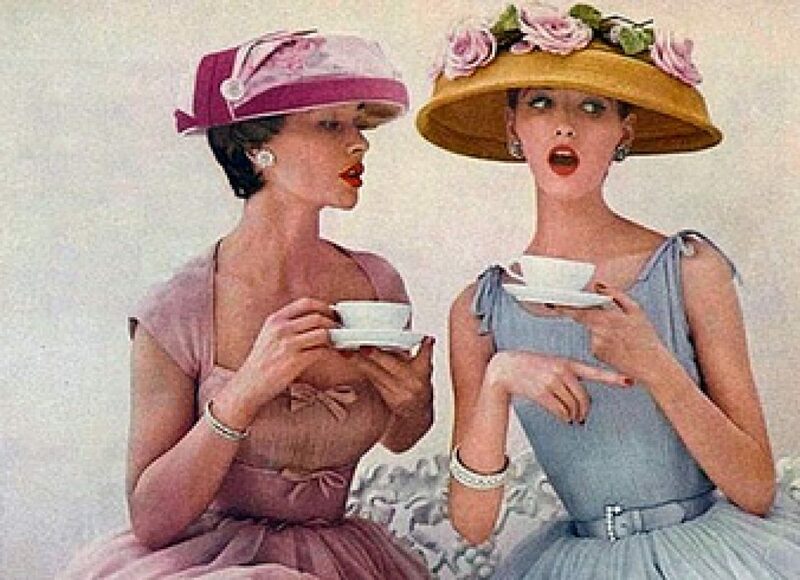 No Vogue…….vogueing- just details, please! I like this top and your fabric choices are excellent. BTW cute dogs, but you knew that. I always enjoy your posts, you have a wonderful sense of humor. We need all of that we can get. When all else fails- bring in the short-legged cavalry! For pets, doors just mean something exciting or delicious is behind it! Our pets have always learnt to open doors, hurling themselves at the handle and thumping it with a paw. I gave up- they are badger dogs- they’d only dig a tunnel in to watch me bathe!? I really figured with Daddy on the sofa, He’d get all the company- they love a sofa snuggle! And now I need to hunt down this pattern! Unsurprisingly I had never noticed it before either – no doubt due to the talents of Lack/Luster. You look fab. And what you look fab in often tends to be similarly fab for me! Thanks! You look fabulous in this! It really flatters you – the style, fabric, colours everything! Thank you- I guess you just shouldn’t overthink things? Adding the asymmetrical feature and the belt…genius…taking a really lack luster pattern and whipping it up into something memorable…go Anne! So glad you did not go with the weird collar! You know collars- they can lead to button downs if one isn’t careful!! As usual a hysterical post which made me literally laugh out loud. 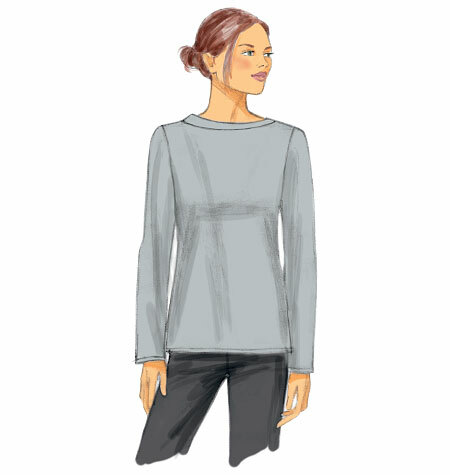 I think that your top is perfection – I adore the side pleat and bow! I’m really pleased with how it turned out- shocked even! Your husband sounds like a keeper! He goes to the pattern drawers for you and gives you his…insight(?) – hilarious! I couldn’t agree more about the pattern envelope illustrations -quite bland – it makes you turn away when the pattern could have the charm that you’ve given it with your great fabric combinations and cute bow. The side pleat is great too. Not to mention the PUPS! He is very organized- he hates a messy drawer- it’s quite funny- he’s told people to sit back down- the drawers are too unorganized- he will get it for them! My busybody! Thank you- I’m not a tutorial blogger, obviously! You can see through Messrs L & L attempts. Lovely details and good fabric colour choices. These fabrics have been languishing far too long in the closet- finally inspiration screamed! Bow is a touch of genius, Phil and Arnie take note. Phil and Arnie are probably already drinking today! They let you get your own patterns in the U.S.? That is a hanging offence in many UK stores. Your husband sounds like a keeper, as is that pattern. No judgment about the dogs – my cat always slept in the bed and felt she was being very generous for allowing us to share. We only have 1 local store that defends the bins- honestly, I can rarely get help of any kind in my usual store- if they staff any less people we may be cutting on the honor system soon!? That is so cute! Sometimes you really have to use your imagination when looking at patterns. It’s true- they just don’t help you much! I like this one on you a lot! The lines seem gentle rather than simple, and the ham is graceful. The bow is just right, too. 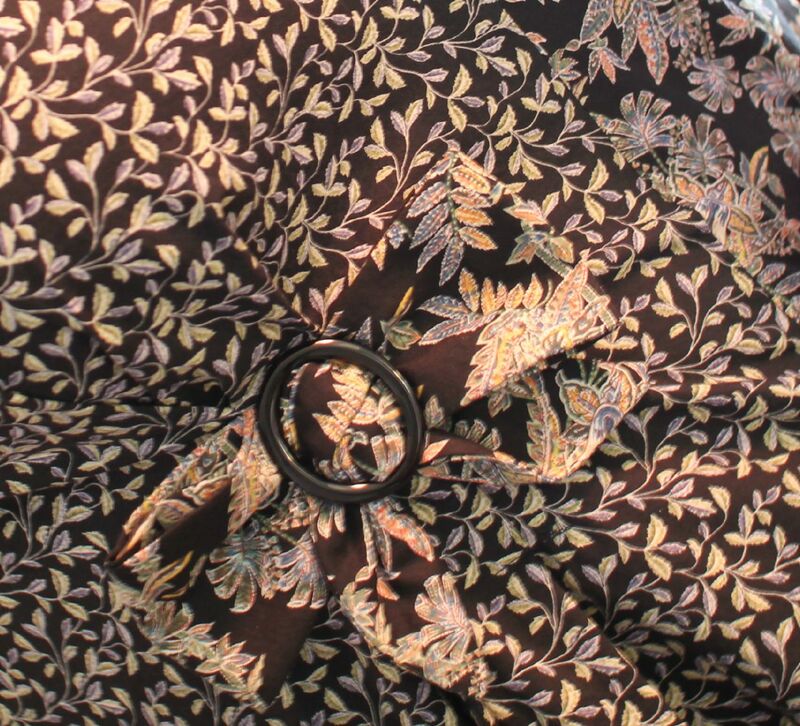 I especially like the calm lines of the tunic combined with the busy-bitzy floral combos – very lush and a lot of motion in the prints, really nice balance with this pattern. I love the dog photos – i was cracking up reading this in the car yesterday. I have to send to my mom (who has her own assistive structures for short-legged dogs). Happy Day!!! Why thank you! I am always looking for patterns that don’t chop up a print too much. This evening the lady pups had their check up and it was dachshund night- so many step owning families on parade! “the ham” should read “the hem”. your sense of humor is catching! Haha! I display my hams a lot! Nothing lackluster about your top! I can’t believe they dropped that little nugget right in your lap (lack/luster) too funny! 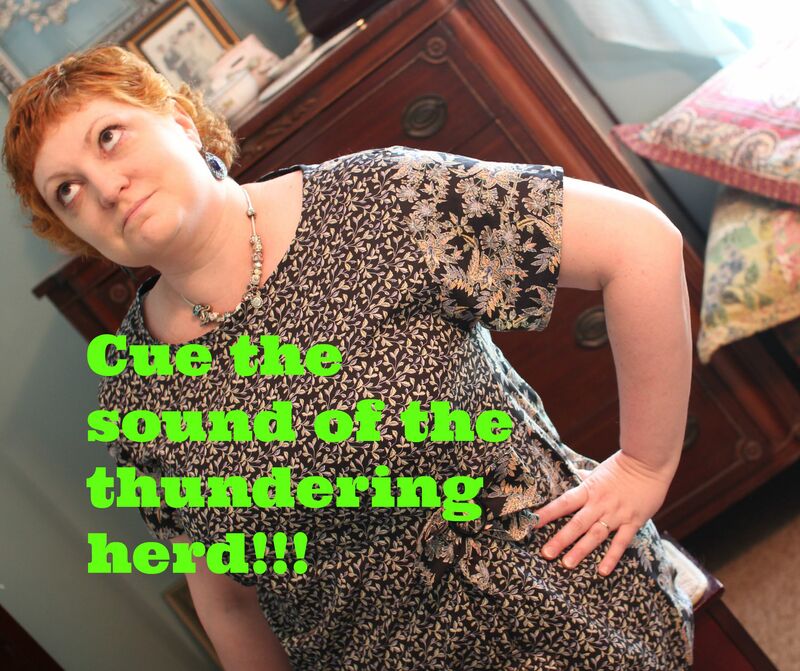 You and your hubby sound perfectly yoked! He is my best accomplice! Yep… you did good. I mean hubby did good? I like the bow addition. I like the top. I like that your hubby goes in to the fabric store with you and pulls patterns! Men everywhere should take note! On Sunday I snuck out to the farrier for pedicure and ran into the fabric store. All 4 employees asked where he was!? A bow can go from elegant classy matron to Honey boo Boo in a heartbeat- luckily we are quite judicious, you and I! We just need to find the Butterick personnel files- I know they were there!! Well you managed to turn Mr Lack and Mr Luster’s drawing into something lovely! 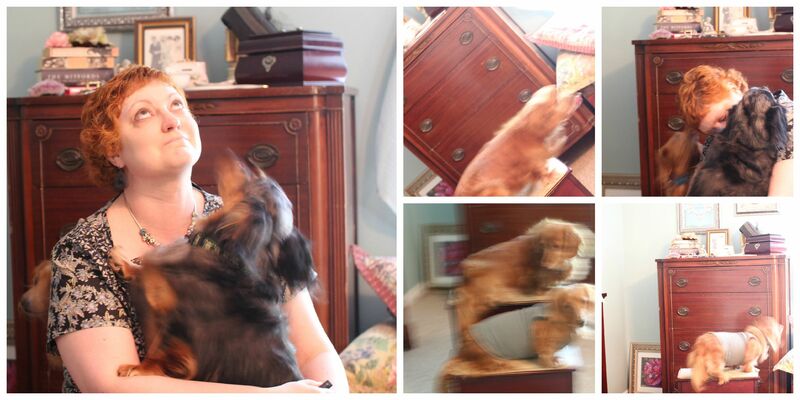 The different fabrics are the key… And it’s never a “fail” when you have cute dogs in the shots! Those pups- such scene stealers!? That is a great tunic. Love the fabric and your bow. Very nice. Thank you- it may get some companions soon- since it worked so well!